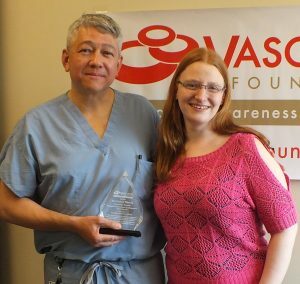 Vasculitis Foundation Announces 2018 V-RED Award Honorable Mention Winners. The Vasculitis Foundation (VF) announced the honorable mention winners of its 2018 Recognizing Excellence in Diagnostics (V-RED) Award. 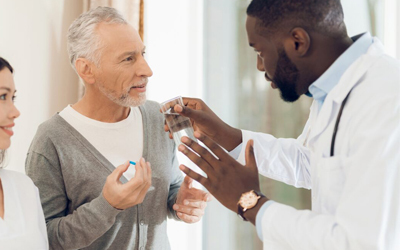 The V-RED Award is presented annually to medical professionals who made a quick diagnosis of vasculitis, thus enabling their patients to receive timely and appropriate treatment, and potentially sparing the patients permanent and ongoing health complications. This year, more than 40 patients nominated their doctors for the V-RED Award. One overall winner was chosen, and three other medical professionals were awarded honorable mention. Dr. Parikh was nominated by Sandy Nye, who was diagnosed with Microscopic polyangiitis vasculitis in 2014 after being sick for more than five years with no definitive diagnosis. Dr. Parikh, a nephrologist, made the diagnosis within four weeks after performing a kidney biopsy and recognizing the symptoms of vasculitis. Dr. Watson was nominated by Nicole Shankey in recognition of his diagnosis of Granulomatosis with polyangiitis (GPA/formerly Wegener’s) after an emergency room visit. Dr. Watson, an otolaryngologist, suspected the rare autoimmune disease after seeing Nicole during the ER visit. He recommended a course of high-dose steroids instead of an emergency tracheotomy. Dr. Kratka, a nephrologist, was nominated by Cindy Solari for suspecting ANCA vasculitis after analyzing her labs which showed dramatically high potassium levels. Dr. Kratka quickly ordered both a kidney biopsy and an x-ray on a nodule in her lung which confirmed the diagnosis of vasculitis. Solari credits Dr. Kratka for also prescribing an aggressive treatment plan of Cytoxan, and carefully monitoring and managing the illness. 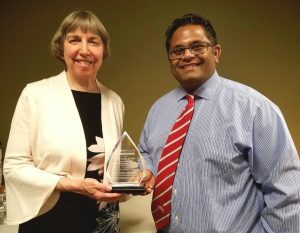 Dr. Linda Brady, a pediatrician with Old Harding Pediatric Associates, Vanderbilt University Medical Center/Monroe Carrell Jr. Children’s Hospital, Nashville, Tennessee, was the overall winner of the 2018 V-RED Campaign.